In our latest installment of our character creation series, Bill Bodden builds a Nosferatu character for Vampire: The Requiem 2nd Edition. I find vampires to be fascinating creatures. Legends and stories about them have developed independently across the globe, and the shape and form of these legends is as varied as the cultures from which they sprang. 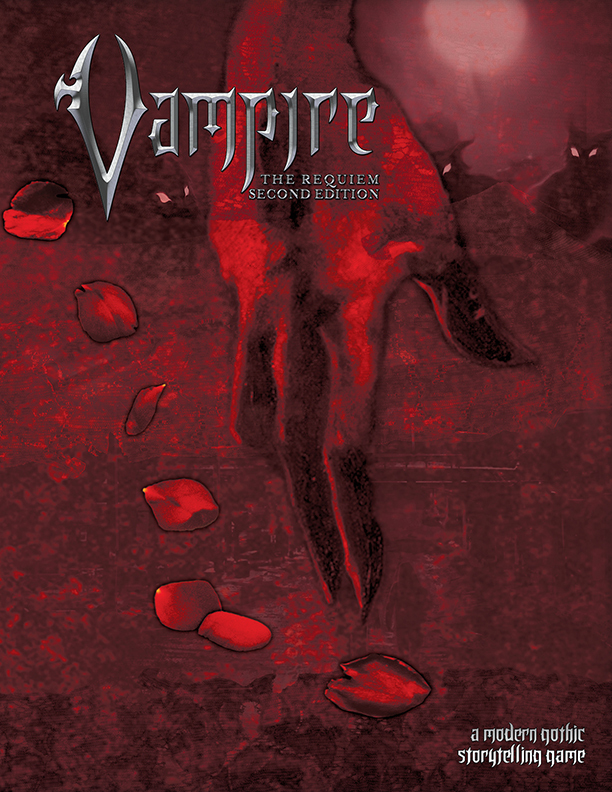 Vampire: The Requiem 2nd Edition has its own setting conventions that tap into the lush fabric of vampiric lore to create something unique within the Chronicles of Darkness, and I’ve enjoyed playing the game. To start building my character, I refer to page 79 of Vampire: The Requiem 2nd Edition rulebook, and focus who he is as a human before applying the Kindred template. Most players either come to the table with a specific concept already in mind, or they allow the concept to evolve organically during the act of character creation itself. I had only a few preconceptions in mind, so the organic route will work for me this time. My basic concept is that of a lonely musician. Geoffrey Groves moved to a new city pursuing a pay-the-bills job, and hasn’t made many friends yet. He plays the guitar for fun, and has honed his talent over the years with diligent practice. When the weather’s nice, he often plays his guitar at night outdoors by the waterfront or in a nearby park. His sire will first encounter him during one of his performances. I make a note of that detail for my character’s background and focus on Aspirations next. Aspirations are short-term goals that earn the character Beats and, by extension, Experience to grow the character’s skills and abilities. Aspirations provide the Storyteller with great ways to draw characters deeper into their own stories and to create stronger ties to clan, covenant, and coterie. As the chronicle continues, players accomplish (or abandon) Aspirations and develop new ones. Geoff’s Aspirations were relatively easy for me to grasp. Though he’s a musician, he’s lonely and performs music to connect with other people. Thus, as a Kindred, his first Aspiration would be to become accepted by his clan or coterie. Second, he moved to pursue a job, so financial concerns occupy his mind. His second Aspiration would be to increase his financial security. Third, music is important to him. Performing at a concert before mortal critics and fans might be too risky for a vampire — but he can always impress other Kindred with his talents. So, his final and third Aspiration will be to perform in Elysium. To best fit Geoff’s character, I am selecting Social as primary, Mental as secondary, and Physical as my tertiary Attribute. I now have five dots to spend in Social, four in Mental, and three in Physical. The basic rules give every character a default one dot in each Attribute, so anything I add will build on that. For his Social Attributes, I decide Presence is key for a performing musician, so two of my five dots go there, plus two more for Composure to help Geoffrey keep his cool as a performer, leaving only one bonus dot for Manipulation. Wits is a handy Mental Attribute for any character to have, so two of my four dots go there. That leaves one each for Intelligence and Resolve, and I’m fine with that split. Lastly, I decide to evenly distribute his Physical attributes and give them one dot each. Geoffrey’s final Attributes are as follows: Intelligence 2, Wits 3, Resolve 2, Strength 2, Dexterity 2, Stamina 2, Presence 3, Manipulation 2, Composure 3. Primary, secondary and tertiary Skill groups get 11, seven, and four dots respectively. Since I’m imagining Geoffrey is a lonely-but-talented guy, I’m going to assume Social is not his top skill group, so that will get seven points, while Mental will earn the top spot with 11 dots, and Physical 4. Skills can be found on page 164, if you’d like to read up on their descriptions. In the past, Geoffrey probably spent some time at a university, and I imagine he had a day job before he was Embraced. I decide to evenly distribute one dot per each Mental Skill, and then take the three dots leftover to Academics, Computer, and Occult. Part of the reason why I’m building Geoffrey’s character this way, is because I’m thinking about what types of actions he’ll take in a chronicle. Geoffrey’s more likely to use Mental Skills than the other two groups, and the penalty for being unskilled in a Mental Skill is -3 die; the penalty is only -1 die for the unskilled use of Physical and Social skills. Geoffrey’s Social Skills get seven dots. This is tricky! I’ve hobbled myself a little here, because to be an accomplished musician, I decide Geoffrey will need more than one dot in Expression. I opt for three dots in Expression; if he’s a talented musician to impress centuries-old Kindred, he’d better be pretty good. Since there are eight Skills in the Social group, I decide to drop three and assign one dot to the rest. Dropping Animal Ken is an easy choice, and Intimidation and Subterfuge aren’t part of Geoffrey’s skillset right now, so I leave those two out. That leaves me with Empathy 1, Expression 3, Persuasion 1, Socialize 1, and Streetwise 1. Geoffrey is not a physically apt character, and I see no real reason to significantly alter that when deciding how to spend points on his Physical Skills. Still, I want him to have some capabilities before applying the Kindred template, so I assign one dot each to Brawl, Drive, Stealth, and Survival. Geoffrey’s Skills now look like this: Academics 2, Crafts 1, Computer 2, Investigation 1, Medicine 1, Occult 2, Politics 1, Science 1, Brawl 1, Drive 1, Stealth 1, Survival 1, Empathy 1, Expression 3, Persuasion 1, Socialize 1, Streetwise 1. Geoff needs three Skill Specialties that speak to his talents. Expression: Guitar is an obvious choice, but what else? I’m opting for Computer: Recording for the second, and Academics: Songwriting for the third. The first thing I must do is select one of the Clans, first described on page 13. Instead of selecting the Daeva Clan, which would be a great fit for a musician, I choose the Nosferatu because I feel Geoffrey’s character will be more challenging to play. Often, the Nosferatu can’t get close to their victims the way a beautiful, seductive vampire could. They don’t need to be ugly to be repellent; perhaps Geoffrey smells bad – like dead fish or vomit. He may have an unpleasant aura about him that makes people uncomfortable or frightened. I also feel that the theme of the Nosferatu-as-outcast is universally felt, and that feeling can induce conflict or be gut-wrenching in the right scene. Since Geoffrey will actively seek companionship within the circles he travels in, I decide to focus on his sire and what she wants. A member of the Invictus would be most concerned with earning boons, so that would be a natural choice for her. Would she insist that Geoff follow her lead, or would she allow him room to grow and to make his own choices? At the start, it’d make sense that the Invictus would also be Geoffrey’s Covenant, and I can explore his relationship to other Kindred in a chronicle. 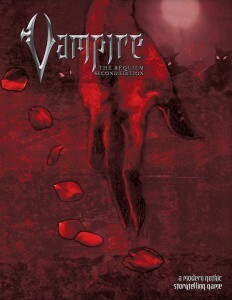 I really like the Covenants presented in Vampire: The Requiem 2nd Edition. They cover a lot of bases that reflect human organizations, and they also offer lots of great opportunities for rivalries and open conflict to enhance an ongoing chronicle. Information on the Covenants can be found starting on page 31. Geoffrey’s Mask is the face he wears in public. Jester would be appropriate, though perhaps not literally. I decide Courtesan would be a better fit for his Mask, underlining his need to perform for the enjoyment of others. Since Geoffrey’s spent years perfecting his musical talent, I opt for Perfectionist for his Dirge, which reflects who he is when interacting with other Kindred behind closed doors. Thus, I go with Courtesan for Mask, and Perfectionist for Dirge. Geoff’s Touchstone is his acoustic, six-string guitar. If his guitar were to be damaged or destroyed, Geoff may be in a world of trouble, as it’s his main connection to his former human self. For a more challenging Touchstone, I would opt for a music teacher that helped him learn guitar, but I settle on the musical instrument. I like each of the Nosferatu Clan’s default Disciplines and can’t decide, so I’m going with a single dot in Nightmare, Obfuscate, and Vigor. I intend that, long-term, Geoff would work to get better at these Disciplines, spending his experience points to add dots, particularly in Nightmare and Obfuscate. Disciplines can be found starting on page 125. Blood Potency for a starting character is one, and I see no reason why Geoff should have more. I have ten dots to spend on Merits. The list of Merits begins on page 109. Haven is a must: Geoff needs someplace quiet and safe to practice guitar, and to keep out of the reach of other Kindred until he’s stronger. He must also choose Safe Place Merit as a prerequisite for having Haven. I put two dots in both for a total of four. I’m also choosing the Fame Merit at one dot; what’s the point of being a musician in demand if no one knows about you? Likewise, choosing the Inspiring Merit could help explain Geoff’s Fame rating. Mentor would be another likely choice, since Geoff will need a lot of advice and guidance from his sire to learn what it means to be a Kindred. One dot in Mentor fills that niche, with an easy option to expand if Geoff’s sire turns out to be attentive. That’s seven dots of Merits so far. Though the Invictus does offer Covenant-specific Merits called Oaths that Geoffrey could take (see page 116), I decide to skip adding them for now. Those Oaths are fuel for further expansion, and I think they’re a good goal depending upon what relationships he develops over the course of a chronicle. As Geoff meets other Kindred, he may decide the Invictus is not right for him, too, which could lead to some very interesting plot threads down the road. To round out the Merits, I choose Clan Status at one dot, Unsettling Gaze, a Nosferatu-specific Merit, is one dot, and Contacts (Bar Owner) also at one dot — Geoff needs a place to practice in front of an audience, and maybe feed a little while he’s at it. Merits are as follows: Haven 2, Safe Place 2, Fame 1, Inspiring 1, Mentor 1, Clan Status 1, Unsettling Gaze 1, Contacts (Bar Owner) 1. Willpower = Resolve + Composure. Geoff’s Resolve is 2 and his Composure is 3, giving him a Willpower of 5. Humanity automatically starts at 7 dots, but it’s easy to lose and difficult to regain. Geoff will have to watch that. Defense = the least of Wits or Dexterity, plus Athletics. Geoffrey has Wits 3, Dexterity 2, and Athletics 0, so he’s stuck with a 2 Defense for now. Size is automatically 5, which reflects most humans. Health = Size + Stamina + Resilience. Geoff has a Size of 5, Stamina of 2, and doesn’t know the Resilience Discipline, so his Health score is 7. Speed = Size (5) + Strength (2) + Dexterity (2) +1 for Geoff’s dot in the Vigor Discipline for a grand total of 10. Geoff’s Initiative Modifier is his Dexterity and Composure ratings added, which gives him +5 to add to any initiative rolls he needs to make. Now I have a fully fleshed out character, and I’m ready to play. For a finishing touch, I’m going to give some thought to my sire. What is her backstory? Why did she Embrace my character? I am leaning toward a Nosferatu who was impressed by the beauty of Geoff’s music, but who noticed his loneliness. She decided his talent could be a part of her unlife, too, and together they might acquire small boons by entertaining other Kindred with his music. With that in mind, I’ll turn to my Storyteller to work out Geoffrey’s backstory and sire further. We’ll figure out how my concept fits into the chronicle, and fine tune his introduction in the game. After that, Geoffrey Groves is ready to play! Who’d play Geoffrey in a movie? I love example character creation, and this one in the form of a blog post was a good idea. Plus, Geoffrey Groves is a neat character, and I like that he emphasizes how Requiem Nosferatu are different from Masquerade Nosferatu. Agreed (on all accounts, these types of things are always fun to write). I love the process of creating characters, so I’m glad to see we’ve finally reached some CofD. Looking forward to seeing more! Oooo… down the road, could character for different Dark Eras settings be a possibility? That would be cool! Nice! I always enjoy the character creation examples when they’re in the books, and I would love to read more of them here. Just one note: it looks like you skipped adding a dot to one of Geoffrey’s attributes based on his clan. For Nosferatu, that’s Composure or Strength. Maybe Professional Training (Musician) 1 instead of Contacts 1.